“To love another—would humiliate my heart,” sings the devoted lover in Johannes Ockeghem’s famous “D’ung aultre amer,” evoking the power of love to captivate, nourish, and, on occasion, destroy. Love can be earthly and sensual; it can also be spiritual and divine, as when a Biblical figure is cast as the object of desire. “To Love Another…” will feature music of both romantic and spiritual intensity by Du Fay, Ockeghem, Josquin, and their contemporaries. **Single tickets for the Sunday, February 10th performance are only available by ordering directly from Stanford Live. (650-724-BING, 650-724-2464, Buy Tickets Online). *Please note the differences in both the weekdays and venues for all 3 of these performances. Cut Circle recaptures the gritty, intense experience of singing early music. Like fifteenth-century singers depicted shoulder to shoulder, concentrating fiercely on their virtuosic lines, we commit to the music emotionally and physically, embracing confident singing, gripping dynamic contrasts, and energetic tempi. As a non-profit organization we give concerts and lecture-recitals, organize workshops and other public events, and publish recordings. Cut Circle’s mission is to bring late-medieval and Renaissance music to life. Hailed as “masterful,” “driving,” and “expressive,” our performances are informed by deep knowledge of the music’s twists and turns as well as cutting-edge research that uses primary documents to unlock questions of performance practice. As a non-profit organization we give concerts and lecture-recitals, organize workshops, and publish recordings for students, scholars, and general audiences. The ensemble has performed at venues throughout the United States and in Europe, with recent appearances at Musica Sacra (Maastricht, The Netherlands), Laus Polyphoniae (Antwerp, Belgium), and the Tage Alter Musik (Regensburg, Germany), and upcoming performances at the Early Music Season (the Netherlands), Stanford Live, and the San Francisco Early Music Society. Founded in 2003 by Jesse Rodin (Director), Cut Circle specializes in the music of Guillaume Du Fay, Johannes Ockeghem, Josquin des Prez, and their contemporaries. In 2010 the ensemble received the Noah Greenberg Award (American Musicological Society), which recognizes outstanding contributions to historical performing practices. Cut Circle has also received the Prix Olivier Messiaen, Editor’s Choice (Gramophone), and a Diapason d’Or. 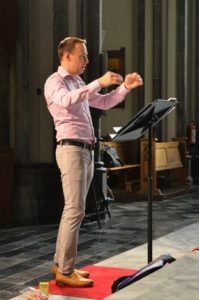 Current projects include a trio of albums that juxtapose the complete songs of Johannes Ockeghem with chansons by Antoine Busnoys and anonymous works from the newly discovered Leuven Chansonnier; a collaborative project with Professor Emily Zazulia at UC Berkeley on the concept of difficulty in fifteenth-century music; and a series of medieval feasting events. Cut Circle records for the Belgian label Musique en Wallonie. Director Jesse Rodin strives to make contact with lived musical experiences of the distant past. Focusing on the fifteenth century, he immerses himself in the original sources, singing from choirbooks, memorizing melodies and their texts, even recreating performances held at weddings, liturgical ceremonies, and feasts. A passionate teacher, Rodin has led seminars, workshops, and masterclasses at the Schola Cantorum (Basel, Switzerland), the University of Vienna, the Centre d’Études Supérieures de la Renaissance (Tours, France), the University of North Carolina, Chapel Hill, the University of Texas, Austin, Cornell University, Princeton University, and Wesleyan University. Rodin is Associate Professor of Music at Stanford University and co-editor of the Journal of Musicology. He is the author of Josquin’s Rome: Hearing and Composing in the Sistine Chapel (Oxford University Press, 2012), editor of a volume of L’homme armé masses for the New Josquin Edition (2014), and co-editor of The Cambridge History of Fifteenth-Century Music (2015). He directs the Josquin Research Project, a digital tool for exploring a large corpus of Renaissance music. Current projects include a monograph on form in fifteenth-century music (Cambridge University Press). Rodin is the recipient of awards and fellowships from the Guggenheim Foundation, the Université Libre de Bruxelles, the American Council of Learned Societies, the American Society of Composers, Authors, and Publishers, the Harvard University Center for Italian Renaissance Studies, and the American Musicological Society. For his work with Cut Circle he has received the Prix Olivier Messiaen, the Noah Greenberg Award, Editor’s Choice (Gramophone), and a Diapason d’Or. He prepares new editions of all the music Cut Circle performs. At Stanford Rodin directs the Facsimile Singers, which helps students develop native fluency in old musical notation. He has organized symposia on medieval music pedagogy, musical analysis in the digital age, and the composer Johannes Ockeghem. He co-teaches “Food, Text, Music: A Multidisciplinary Lab on the Art of Feasting,” in which students explore historical sources, attend to issues of aesthetic experience and sustainability, and cook medieval recipes in Stanford’s Teaching Kitchen.